Concho Educators Federal Credit Union was chartered in 1941 to fulfill the financial needs of educators within Tom Green County. The initial field of membership for the credit union was limited to teachers and administrators employeed by the San Angelo Independent School District. Soon the benefts of the credit union were recognized by other employees of San Angelo Independent School District and the surrounding five county school districts. They each requested and were granted full membership into the credit union. In 1952, the faculty, staff, and administration of Angelo State University were brought into the Concho Educators's field of membership and in 1980 the students of Angelo State University were added. On July 1, 1981, San-Tex Credit Union merged with Concho Educators which allowed employees of the San Angelo State School into CEFCU's field of membership. 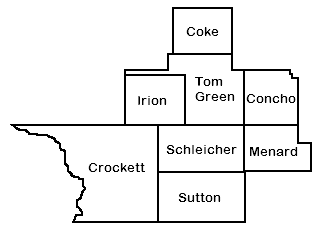 In March of 2006, Concho Educators expanded it's field of membership to include all residents living in Tom Green County. Today, the credit union has grown to more than $75 million in assets and over 6,600 members/owners. The credit union's success since 1941 has been a collective effort between the members, Board of Directors, Supervisory Committee, Management and staff. All schools districts in the following map are elegible for memberhip. However, anybody that lives, worships or attend school in Tom Green county is eligible for membership.